The Easter egg. Growing up, I never knew how eggs got invited to the party. It was only when my nephews and niece were old enough to go egg hunting that I looked it up. You know, in case they ever asked why I put together an Easter egg hunt, I felt like I should know. I came across a few explanations, but my favorite compared looking for the eggs to looking for Jesus in the tomb. 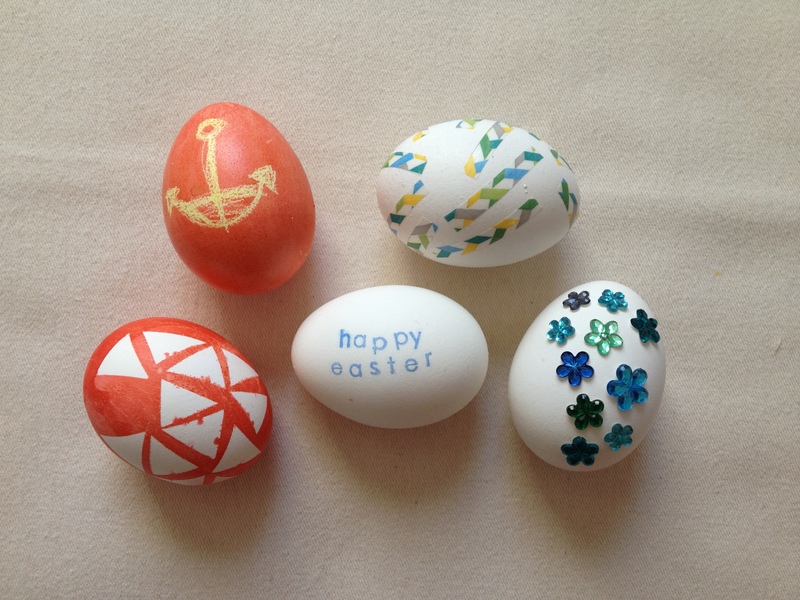 Today I thought I’d share some Easter egg decorating techniques that even the shyest of crafters can do. Plus, all of the supplies are easy to find and you might even have some already. For all of these projects I used hard-boiled eggs. 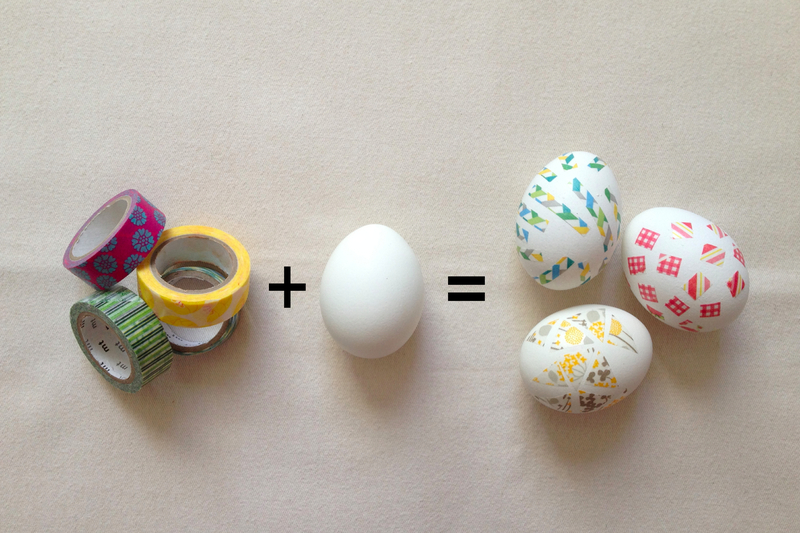 You can also empty out the insides, rinse, and just use the shells if you want your egg art to last longer. Protip: Use room temperature eggs; materials will stick better to the shell. Cut out triangles, squares, stripes, whatever you want – and stick. That’s it! Try mixing patterns, shapes, and colors. 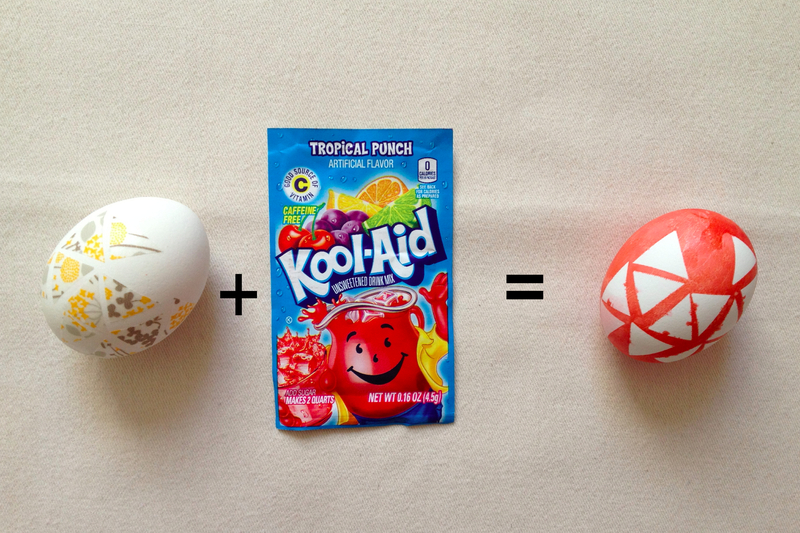 If you’re using Kool-Aid, it doesn’t take very long to stain your egg. Soak for at least 5 seconds. The coloring will stain your fingers, too, but will wash off with soap, water, and some scrubbing. When drying, the excess liquid will drip to the bottom. 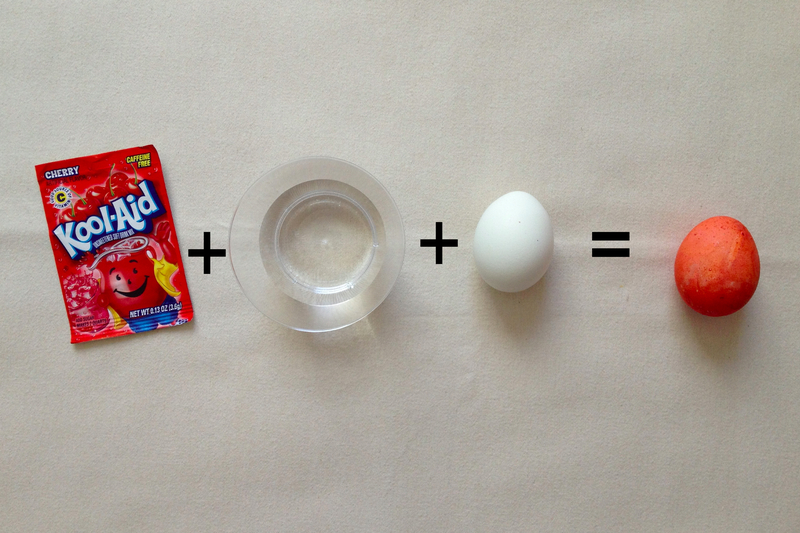 Make sure to rotate the egg so the dye doesn’t concentrate in one area. It will, however, give some interesting color spots. Add some sparkle to your celebration with colorful gems. For this project I used mini glue dots for my adhesive. You don’t have to wait for anything to dry and you don’t have to worry about the sparkles falling off – these dots are sticky tough! 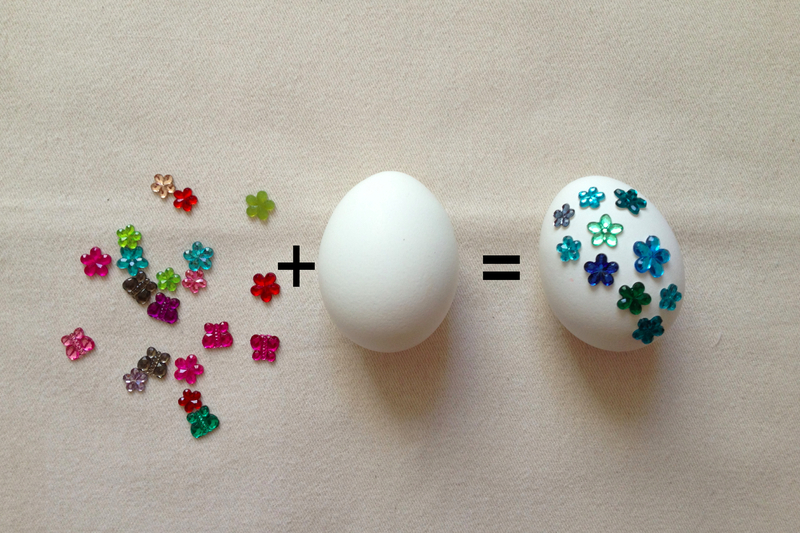 For easy application, place the sparkle on the glue dot, press down, peel, and stick on egg. 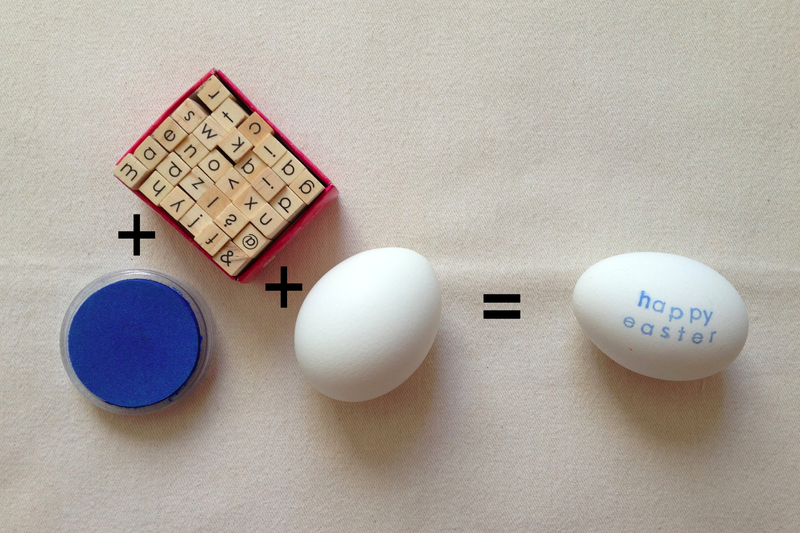 Stamp a fun message on your egg. Tahdah! Allow the ink to dry completely. Draw anything and then dip into your dye of choice. The crayon wax will prevent the dye from staining the egg in marked areas. Protip: Use crayon colors you can see (i.e. not white) so you can be sure the image will appear after the dip. Create negative images with stickers. Attach stickers, making sure all of the edges stick to the egg (Mine didn’t stick so well.). 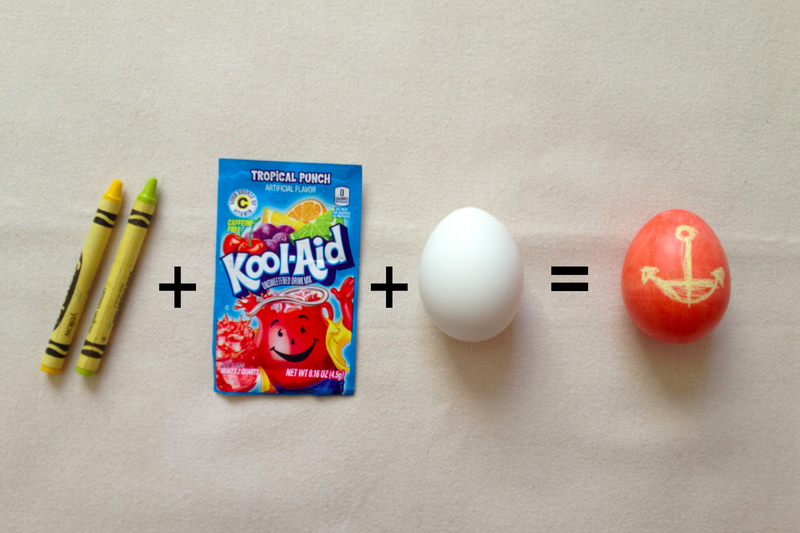 Then, dip the egg in your dye of choice. Protip: Using smaller stickers, or stickers with more flexibility (so they can wrap around the egg curves) may help to get clean edges. I hope your Easter season is full of love, feelings of rejuvenation and hope, and extra special crafty time with family and friends. Happy Easter! Next Postcooking with daddy, episode 001.